As a preface to this post, I’d like to ask you to (1) forgive the length and the lateness because I just figured out how to get WiFi here and (2) take my recommendation that you read this leisurely and in pieces, like a Dickens novel or good comic series (though I promise you neither). The journey to Hong Kong and then Jakarta went surprisingly smoothly and quickly, and I got through immigration without a hitch. When we got to the hotel, AMINEF, the organization that oversees the grant distribution in Indonesia and makes sure we’re all taken care of, gave us brick phones. This way we have an Indonesian number and a phone line where they can reach us. Mine is bright yellow and reminds me of my old Gameboy Color. Minus Pokemon. Still, it’s pretty great, although it was weirdly challenging to go back to typing/texting with the number pad. I still have my American phone as well so that I have a way to use WiFi and WhatsApp and all that jazz. I have T-Mobile and they supposedly offer unlimited texting and data worldwide…if you can get a signal. By some miracle, I have a pretty great signal in Indonesia (both Jakarta and the small city/village I’m in, Wonosari). This is hilarious to me: T-Mobile has better service in INDONESIA than in Nebraska. Indonesian phones essentially operate on pay as you go plans. You buy what’s called Pulsa to get data and phone/text service and use a little bit every time you call or text or use the internet. Pretty simple! You can buy Pulsa all over the place, and a bunch of us ETAs went and loaded our phones up. Earlier in the day we had a security briefing in which AMINEF and the three ETAs who are returning for a second year went over some basic dos and don’ts for the first week. Afterwards, we met in smaller groups and got more info about our specific sites. Rizqi, the AMINEF member responsible for my site, said that Wonosari isn’t a city, it’s basically a village. When prompted about what there is to eat, he responded with “Well….” and a nervous laugh. Apparently there aren’t many restaurants (“warungs”), so I’ll be pretty much on my own. He also said I’d be living alone, although in the same house as Anna, the wonderful ETA who was in Wonosari last year. In Indonesia it’s rude to eat, take items, or give gifts with your left hand. As a left handed individual, this seemed rather problematic. I asked Grace, one of the three returning ETAs about it, as well as Rizqi. Both said I should really try to learn to use my right hand to do things. I asked Rizqi whether it was okay to write with my left hand. His response? “No.” I’ve decided to chop it off to prevent embarrassment, horror, and cultural ineptitude. This entry has taken me so long to write because I’ve had to do it single handedly. But all is now right in the world (HAH I’M SO FUNNY). After a very short flight to Yogyakarta (or Jogja [“JOKE-juh”] as Indonesians call it), I met with my counterpart at the school, Pak Rifa (AKA my guide, shepherd, and guardian angel). He, his wife, and his 30 month old daughter, Kiki met me at the airport and all three are wonderful. After dropping the others off at their home, Pak Rifa and I continued on to Wonosari. We talked quite a bit, and I asked him what the students are like, what they’re families do, what most will do upon graduating. Most are from poor families, many of whom farm. They’re very nice, but they’re English is extremely basic. He wants me to really focus on getting them out of their shells and talking talking talking in English (Bahasa Inggris). Only about 30% go to college; most of the students will move to bigger cities to work in factories. As such, there is little motivation to learn English. Here’s hoping I can add a little motivation! After he questioned me about the bloody stump where my left hand had been, I confessed to Pak Rifa that I was left handed. He said that that was okay. I should try if possible to eat and hand over money and such with the right hand, but I could write on the board with LH. I flung my arms up and railed against the injustice of the universe. Luckily, Mom taught me some basic sewing skills before I left home, so I was able to put LH back on. It was a little harder than putting on a button, and my handiwork is still a bit rough, but I’m still proud of myself. When Pak Rifa and I pulled pulled up to my new home (my rumah), we were greeted by Bu Mul, the lovely woman who owns the house (and is my other guardian angel here). She’s also a teacher at my school, MAN Wonosari. Quick sidenote: Pak, short for Bapak, means “father” in Indonesian but is also used as a title to show respect for men older than you; likewise, Bu, short for Ibu, means “mother” and is used to address older women. The house is very nice—there are two bedrooms and bathrooms. I’ll be living by myself, so I got to choose the bedroom I wanted. I went with the air conditioned option (only room with AC, and it is amazing). Even though there are no other humans living with me, I have plenty of company—a very friendly dining room lizard who either moved to the kitchen today or brought a friend, some ants (Dad, you’d love them), and chickens/roosters across the street (best alarm clock in the world). Pak Rifa and Bu Mul said we were going to meet the mayor/governor (“kepala desa”) of the neighborhood I live in. We were about to leave when they said it is customary to bring Oleh-Oleh, gifts to show good will, respect, and kindness. I had plenty—I filled half my luggage with Oleh-Oleh, but I hadn’t unpacked anything. I had two very full suitcases, one very full backpack, and a very full messenger bag. And there was absolutely no rhyme or reason to where I shoved what. I put books in a box of Cheez-Its; I shoved American-themed sunglasses in with animal crackers; one of my bag’s pockets was bursting with stickers and underwear. It was a mess. Cue immediate panic. These two wonderful people were now waiting for me. I was holding us up. AND I couldn’t bring out Oleh-Oleh for the head of the neighborhood and not for my two guides/parents/lifelines in Wonosari. After much scrambling and little success, I packaged together a few things for Pak Rifa, Bu Mul, and the kepala desa. These included some candy, some Americana items, and a t-shirt for Pak, a mini American flag bear for Bu, and a calendar with pictures of national parks for the neighborhood head. They all seemed unenthused and I felt the searing pain of failure. I’m unsure whether I’d actually insulted/offended/not lived up to standards, or I was just jetlagged and self-conscious and scared and negative. Went home and started crying. T Swift calmed me down. I unpacked a lot and began exploring my new home some more. I have a nice fridge/freezer combo that’s not quite as big as an American fridge but certainly big enough. This has become another good friend because I do not want to feed the ants (I’m mean, I know) and they can’t get in and don’t want to get in because cold. So when in doubt, shove it in the fridge. Chicken Bu Mul made me? Fridge. Jello-like item in small cups that Bu Mu made and which I would eat for breakfast because I didn’t have any other food? Fridge. Loaf of bread? Fridge. I’m also trying this thing where I shove food in Ziploc bags and hope the ants are fooled. Will update you at a later date. bak mandi. For the first two days I was too rattled and frazzled to actually read what he sent. I assumed that the water that came out of the showerhead came from the reservoir. This is not so. 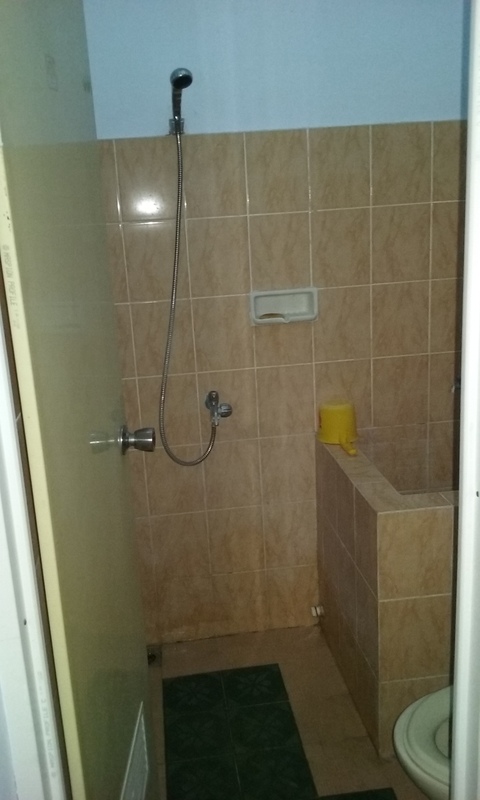 Traditionally, the reservoir is usually used as the shower itself. You use a small plastic bucket-scooper and dump it on yourself. You would also use water from this reservoir to “flush” traditional squat toilets (I just figured this out earlier today when, utterly perplexed, I tried to figure out how to flush the toilet at school). You can also use it to wash your hands or brush your teeth (I’m opting for bottled water on the latter and had been using hand sanitizer/the kitchen sink for the former). With the showerhead I don’t really need one, but if there’s a water shortage I can use the basin for all my water needs. So it’s basically the Swiss Army Knife of bathroom essentials. August 25 – First Day at School! 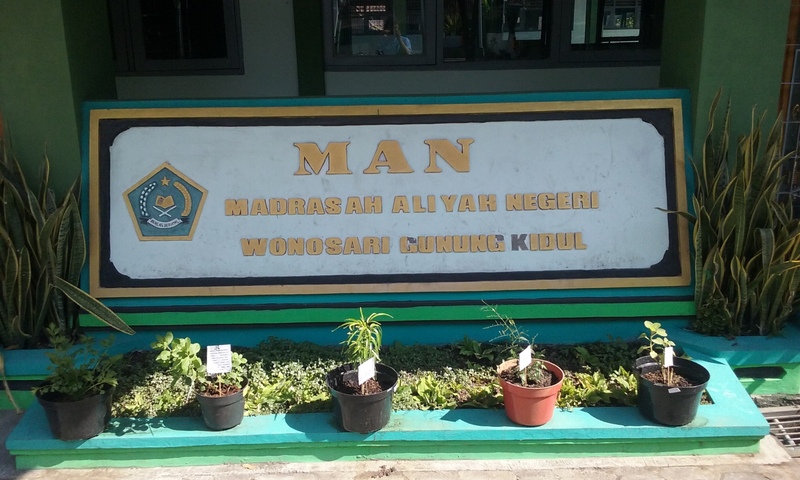 The plaque for my school–MAN Wonosari! Yesterday I went to school for the first time and began meeting all of the staff and teachers. There are many. I asked Pak Rifa for pictures and a list of names so that I can try to learn who everyone is. I brought some Cheez-Its, animal crackers, and Star Wars graham crackers to share with everyone. Hopefully they enjoyed the Oleh-Oleh dari Amerika (“gifts from America”). I thought a file of one on the external hard drive in my bag (on Pak Rifa’s insistence I didn’t leave my valuables at home). So we went to the photo place to print. Turns out I didn’t have the file on the external hard drive, just my computer. Which I just realized was also with me along with a USB so I could have totally put it on the USB to print. Alas, in the moment I was panicked and thought of nothing. Luckily the photo place not only prints photos but takes them also, so I got a spiffy new passport-sized photo. AND UNLIKE IN AMERICA, THEY ENCOURAGED ME TO SMILE! While we waited for the photos to print, Bu Mul treated us to lunch. We all had bakso, which is like a meatball soup. I also had hot tea. It was very sweet. Southerners would love it, but I usually drink tea black. Or with a pinch of sugar. When I was almost done drinking it, Bu Mul asked why I didn’t like my tea sweet. I was understandably confused because it was basically candy. Turns out the Javanese put sugar on the bottom of the glass and you’re supposed to stir it in to your liking. I hadn’t stirred at all. Which. Wow. Holy sugar Batman. I decided to stir it then just to see, which made Bu Mul laugh because the tea was almost gone and so would be hyper sweet. And it was. It was like taking a sugar cube and wrapping that sugar cube in a tea-flavored fruit rollup and then stuffing it inside a giant tea-flavored gummy bear. But liquid. We then stopped by and bought some bakpia, a regional specialty dessert that’s little dough pockets filled with smashed up sweetened beans of some sort. They’re about the size of fried oreos and delicious. Probably healthier too. Then we went back, picked up the pics, and returned to the station. There one of the officers (I think?) wanted to take a picture with me, the bule (foreigner, usually white). As Pak Rifa explained later, I am the only bule in town, so I stick out like an elephant in a field of tiny baby lizards. It was a long trip, but an exciting one. I got to see more of Wonosari (on the back of Pak Rifa’s motorcycle! ), and it really isn’t as tiny as Rizqi led me to believe. It’s definitely small, but not what I think of as a village. Also, they just celebrated Indonesian Independence Day on August 17th, so there are really colorful flags and banners everywhere hanging from bamboo poles on the sides of the roads. There are even some Christmas lights! I also bought toilet paper, bread, Nutella, paper towels, and spaghetti. So that was a win. After I napped for about three hours, Bu Mul returned with her daughter, Anisa. They were kind enough to bring me dinner—tofu, jackfruit, bean sprouts, rice, and tempe (NOT tempek, which is apparently a bad word and made all of the teachers laugh when I said that instead of tempe [which is also really weird because the “K” sound at the end of a word is a glottal stop, like the stop after you say the “uh” in “uh-oh,” and I still haven’t figured out how to make it except I somehow made it. I was very confused]). It was delicious dinner though. The pills must be working. Because this post was ridiculously long, I’m going to stop for now. Tomorrow I’ll try to post part two of my first week in Wonosari (topics include meeting students, buying batik, and feeling like I’m not an incompetent moron after all!). Four years ago, I crammed my belongings into a minivan and headed cross-country to begin college at the University of Nebraska-Lincoln. I joked that I was moving a world away from from James Hollow Court, from my childhood home in New Jersey. Flash forward to today: I’ve downsized from cramming an entire minivan to just two suitcases and a bulging backpack. And this time I really am going a world away. 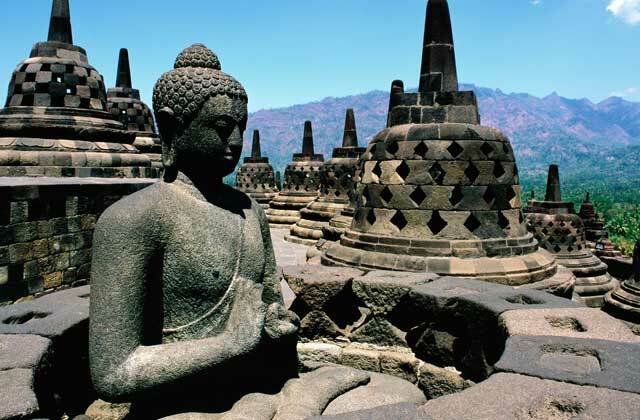 For the next nine months, I will be living in Wonosari on the island of Java in Indonesia. I will be serving as an English Teaching Assistant in a madrassa, an Islamic high school, through the Fulbright program. I am about to embark on an adventure – it’s going to be incredible and stressful and amazing and terrifying and wonderful and hard. Part of me feels like I’m about to go on my first upside-down roller coaster. It’s really scary because roller coasters are big and fast and make people vomit and GO UPSIDE-DOWN. But underneath this trepidation is excitement. So as long as I buckle myself in and take a deep breath, I should be able to do this. And I probably won’t vomit. I’ve decided that blogging will be the best way to chronicle this roller coaster ride. 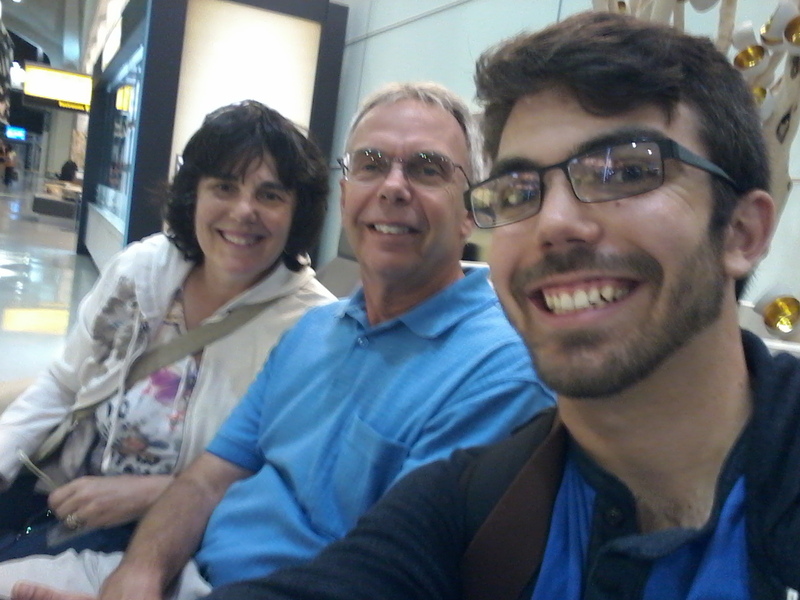 With an 11/12 hour time difference and an iffy wifi situation it’ll be tough to stay in contact in real time, so this blog will allow me to pour out my experiences (and there will be lots of pouring) for my family and friends to see what I’m up to. And now for some top 10 lists. Rice. Will I be able to eat rice every.day? Distance. I’ll literally be living on the other side of the planet. Everything and everyone I know will be very, very far away. Mistakes. I’ve been reading up on Indonesian culture to avoid doing so, but mark my words, I will make a fool of myself at least 2.5 times. Netflix. I won’t have it. How will I watch season two of The Unbreakable Kimmy Schmidt?! The sun. Wonosari is about 7 degrees from the equator. Which means hot humid all the time burning sun beating down boiling muggy sweat sweat Sweaty McSweaterson. Communication. I’m working hard to learn Bahasa Indonesia, the standardized language used throughout Indonesia, but I’m far from fluent. 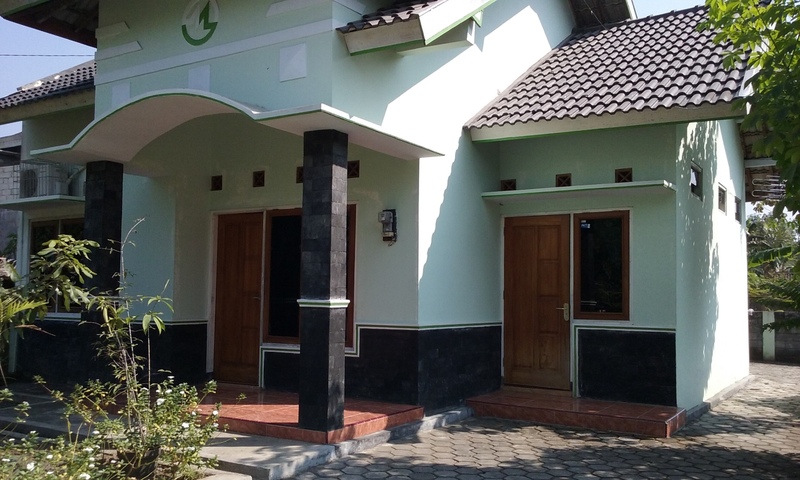 And I’ll be living in a rural site where many people will speak Javanese (instead of Bahasa?). Wifi. Will I have it? Who knows! Oleh-Oleh (small gifts to give to neighbors, coworkers, students, etc. to show respect for my new community). HAVE I PACKED ENOUGH?!?!?!? Teaching. Will I be able to teach? Will I be able to teach well? Will I be able to teach high school students well? Theatre. The chance to learn about wayang kulit, traditional Indonesian theatre from Central Java. Religion. I know little about Islam, but can’t wait to learn about it. Culture. The opportunity to immerse myself fully in another culture, to learn about and experience new food, art, architecture, language, everything! Height. At 5’6.5” I’m short in America, but TOTALLY AVERAGE SIZED IN INDONESIA! THIS MEANS CLOTHES WILL FIT AND I WON’T LOOK LIKE ONE OF SNOW WHITE’S DWARVES. Time. I’ve no idea what my schedule will look like, but I feel as though I’ll have moments of quiet and solitude where I’ll be able to read, write, and reflect on who I am and who I want to be. Like Thoreau, I have the chance to escape the chaos (or maybe trade one chaos for another) and think. Teaching. I used to think teaching was lame because there’s no glory in it. I suppose this is true because teachers don’t generally win Nobel Prizes or Tony Awards or Super Bowl Rings. It may not be a Nobel profession, but it is a noble one. Teachers shape our children and foster learning, growth, and creativity. While teachers themselves may not win prizes, awards, or rings, they can encourage and help their students get there. And that’s pretty damn cool. Friends. Forging new friendships with both my fellow ETAs and everyone I’ll meet in Wonosari. Figuring it out. There’re a lot of things that will happen that I am not prepared for and cannot prepare for, and I’m excited about that. Adventure. Without a doubt, this experience will be incredible and I will see both sides – the good and the bad – of the adventure coin. Here’s to it!